Neptune is a planet. [I Don't Believe This] Its astronomical symbol is ♆, a stylized version of Devil's trident and it is said that this symbol was given to a planet by a satanist. Neptune is far away in this galaxy and is one of the 9... er... that is, 8 planets of the solar system. Pluto recently had to resign its planet title since it lost by KO to Neptune in a unification bout. One thing many people don't know is that Neptune actually has one ring like Saturn does but lost it and can't find the damn thing since it is its old engagement ring. As the marriage with Uranus was ailing, the couple soon broke up and Neptune took off its ring for some time. It's probably floating around the Solar system somewhere. Scientists say the spherical bunch of gas just doesn't seem to care. Neptune is freezingly cold and has no atmosphere. Even though it is represented as a blue planet, it is actually darker than the darkest dark side of the moon because the Sun is so darn far away. Neptune often feels lonely because it knows deep in its guts that man will never reach it. For those without comedic tastes, the "questionable parody" of this website called Wikipedia have an article about Neptune. Over the years Neptune has been very productive in every kind of artistic expression. 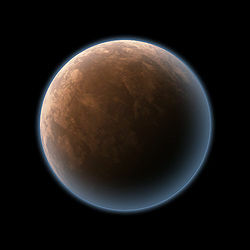 Although this planet has been the inspiration for many paintings, poems, books and other boring stuff, it is more famous for its remarkable career in the music industry. La Surface de NeptuneAn attempt of famous realist Gustave Courbet to capture the dark surface of Neptune on canvas. Neptune has fascinated quite a few painters for the longest of times. Most of them transported their admiration in the canvas creating many infamous artworks. A lot of these fine pieces can be found around the world as many people tried to capture the beauty of Neptune in a painting. (Little Known Fact: Althought this planet is a very usual subject for a painting we don't usually see many of them in museums. This travesty occurs because the paintings are bought by rich mafia bosses and shipowners before the museums can buy them from their previous owner). Neptune can be seen in artwork created using different painting techniques such as realism, surrealism, cubism and throw-the-paint-buckets-on-the-wallism. Neptune has finally released one of the darkest albums that borders on a Gothic sound and features some incredible riffs that stay with you long after the album has ended since the cacophony just keeps human ears buzzing for a week or two. The album cover features William Blake's "Nebuchadnezzar" and looks like death warmed up, hence akin to Neptune's cold atmospheres. Neptune is quintessential prog rock and deservedly finds a place on all the greatest prog rock lists. It begins a chilling piano introduction that sounds a little like some of Van der Graaf Generator's early works. The hypnotic riff kicks in and continues throughout the first half of the song while the tortured vocals of Neptune's Moon speak of fear and morbid dread of death. With all these elements, the track acts as an example of all that encompasses the sound of Neptune: killer guitar riffs that interchange from slow to fast, sparse, minimalist piano, and morbid lyrics. The planet has a bombastic heavy shuffle rhythm, and features some wild drumming time sigs that move from 12/8 to 35/6. The bass on the whole planet is actually produced, according to the album's credits, by utilising a superb 'combination of strong left hand and foot pedal techniques, coupled with special sound reproduction devices fitted in his Hammond'. An interesting and unique sound is thus the end result. In this case there are weird screeching sounds that actually add to the song structure. One track merges three riffs to create one great song. It has a killer riff that really gets into your brain. There are no bonus tracks so it's not a long album, but this is nevertheless an essential purpose for all prog fans who like their prog heavy with killer guitar riffs, vibrant keyboards, excellent percussion, and scintillating vocals. Pluto has never forgiven Neptune for being kicked off the planetary list. The official word from NASA is this planet does not support intelligent life. This decision came out when scientists, after lengthy surveillance of the planet, found out that the creatures living in Neptune had an IQ small enought to be called brainless. Hearing that, a number of people including famous politician George W. Bush tried to buy parts of Neptune, using them as possible future residence. In spite of the big amount of cash offered, their efforts were unsuccessful. 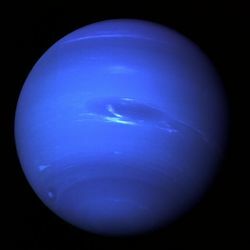 Back to our point now, Neptune does support death and is home to some heavy metals, so it should come as no surprise it's actually growing long hair to swing around as its music hits the intergalactic airwaves. It has been speculated that alien intelligences from another planet visited Neptune in the past and are solely to blame for the planet's jaded reputation. It is also a widely held belief that aliens are to blame for the so-called controversial Pluto conspiracy that culminated in Pluto becoming a non-planet entity. This page was last edited on 9 December 2013, at 23:15.